The first entry for Green Hill’s Mortuary Reports in December 1886 reads, “John Ricks (Supposed) burned to death in the fire that burned R.W. White’s Stable, December 4, 1886 B B Temple, City Phys.” He is indicated as a pauper in the margin, where the burial location of the body is usually written. 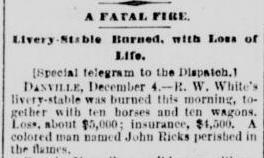 I was able to find a few blurbs in historic newspapers regarding the fire in which Mr. Ricks “supposedly” perished. Unfortunately, without knowing John’s age or the names of any of his relatives there isn’t much more that can be added to his story. In online death records his name is spelled Rix, but even searching for John Rix leaves me empty-handed. 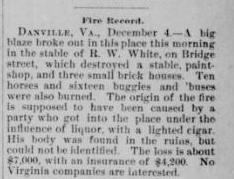 There are people with his name listed in directories for other cities in Virginia for the years prior to 1886, but it could simply be that someone shared his name.1 It’s also likely that John was new to Danville because there is no evidence of him living in town. Being December he could have been seeking refuge from the elements in the livery stable. It’s possible that he fell asleep while smoking or dropped his cigar, not realizing the hideous horror that would become of his recklessness. Of course the wording in Green Hill’s burial records casts suspicion as to whether or not John Ricks was the man really buried there at all.